An international biathlon event at the Fort Kent Outdoor Center, which was rescheduled due to adverse weather, went on without a hitch this past weekend thanks to local volunteers. FORT KENT, Maine — An international biathlon event at the Fort Kent Outdoor Center, which was rescheduled due to adverse weather, went on without a hitch this past weekend thanks to local volunteers. The FKOC originally planned the NorAm #6 biathlon during the weekend beginning Friday, Jan. 18, until weather forecasts predicted a winter storm which would drop nearly two feet of snow on the St. John Valley. FKOC President Carl Theriault said weather conditions were ideal this past weekend. 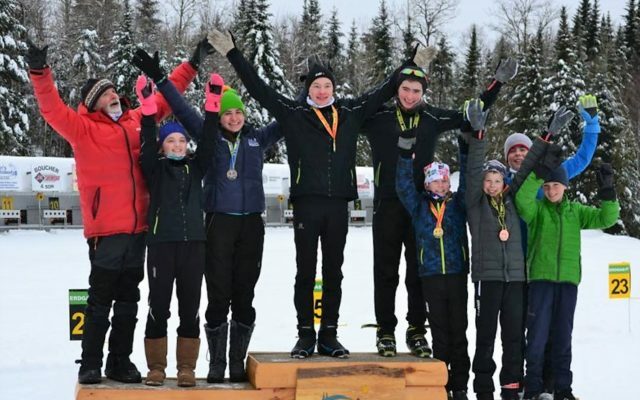 Although Theriault said the number of competitors was down at the NorAm 6 due to its being rescheduled, among the nearly 20 biathletes who participated in the event were eight youths who represented the FKOC. Despite the short notice of the rescheduled NorAm event, the FKOC was not short of community volunteers who were willing to help out, according to Theriault. Among those volunteers were Donald and David Guimond, whose late brother Scott Guimond contributed so much time and effort toward volunteering at FKOC biathlon events that the FKOC named a section of the competitive trail in his honor. The Guimonds manned the penalty loop during the NorAm competition in honor of their brother. Scott Guimond, the youngest of his siblings, passed away nine years ago. Canadian athletes dominated both the Saturday sprint race and Sunday mass start race at the NorAm. First-place winners of the Sprint included Reagan Mills of Prince Edward Island in the men’s race. Callie Campbell, also of Prince Edward Island, took first in the junior women’s division. Madison Taljaard of Nova Scotia was the top athlete among youth women. Jim Kettering of Biathlon, N.B., mastered the master men’s division. Simon Hale of Prince Edward Island took first in the U17 boys category. Fidel Wendt, also of Prince Edward Island, scored the most points among the U15 boys, and Fort Kent’s own Fletcher Marquis topped the U13 race. Sunday’s mass start results were identical, with the exception of the U17 boys contest, during which Fort Kent’s Sam Bosee bested Hale, and the U13 division, which Quinn Michaud of Fort Kent won. For a complete list of NorAm race results, visit the Fort Kent Outdoor Center website.